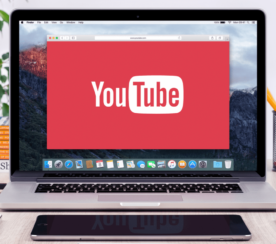 Although the reports of Twitter’s death have been greatly exaggerated, the social media platform has dipped in popularity, as shiny new toys like Instagram and Snapchat have captured the imagination of the public, especially Millennials. But Twitter still has 328 million monthly active users, 100 million daily active users, and 500 million tweets are sent every day on the platform. 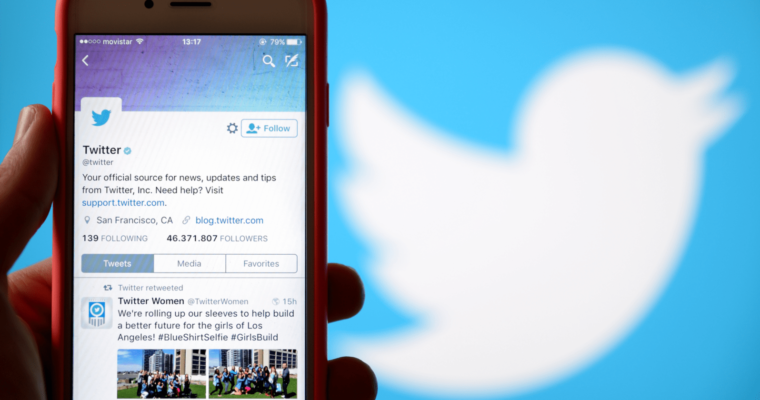 Twitter has definitely taken a hit, but it remains a viable marketing tool for businesses, and its Advanced Search feature offers multiple opportunities for brands to refine their marketing strategies. Businesses can now tailor search results based on a range of dates, people, hashtags and specific phrases, while also excluding words and phrases. This provides refined searches that can help you understand current and previous trends, and hone in on the behavior of your targeted audience. 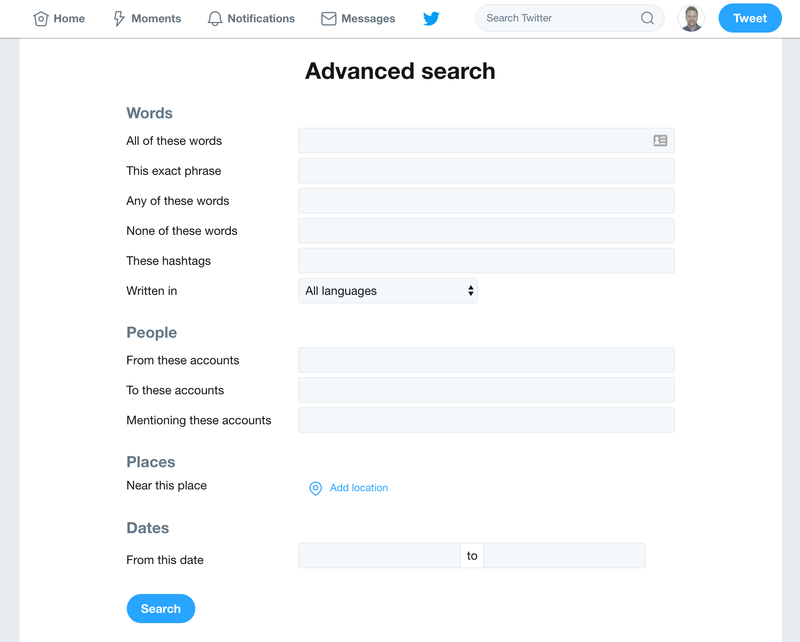 What follows is a simple guide on how to use Twitter Advanced Search, with actionable tips that can help you use this tool with maximum efficiency. To access Advanced Search, type ‘twitter.com’ and enter a phrase in the search bar. Once the results have appeared, click on More options > Advanced search. Or, just navigate directly to twitter.com/search-advanced. What’s cool about these fields is that you aren’t limited to just choosing one, so for example, you could perform a search that combined an exact phrase, from specific accounts, during a specific date range. Before moving on to what happens after you hit Search, let’s explore some of the common search queries and how you can use them to refine your searches. The six fields under the Words heading help you include or exclude a number of different words and phrases in your search. 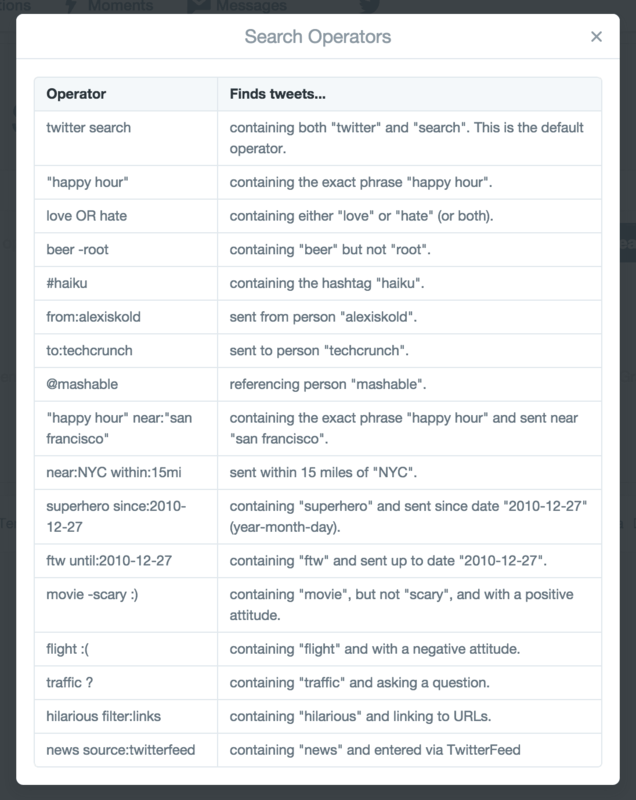 All of these words: Use this field to find tweets that include the words or phrase you type. To ensure the best search results, use quotation marks for phrases. This exact phrase: Use this field to enter a very specific phrase. So if you were searching for tweets about Heisman Trophy winners that attended USC, you would enter “USC Heisman Trophy Winners,” instead of just “Heisman Trophy Winners.” One cool thing is that quotes are automatically added in this field. Any of these words: Use this field to search for a group of related words. For example, if you’re looking for USC football mentions, you could type ‘#USC football, USC football, @USC football, and USCfootball.com. The search field would add the word ‘or’ in between each word or phrase you typed to trigger the most specific results. None of these words: Use this field to eliminate any tweets that contain words or phrases you don’t want to be included in a search result. For example, you may want results for ‘USC,’ but you may want to exclude any mention of ‘USC football.’ This is an effective way for businesses to exclude search results for the names of other companies in the same industry. These hashtags: Use this field to get results about specific hashtags. For example, if you’re a sneaker company and you want to check out what people are tweeting about regarding a big brand, you could type ‘#Nike’ to get results. Written in: Use this field if you want to get information about tweets written in one of the more than 50 foreign languages listed. This may help if you are analyzing the foreign market in your industry. Under the People heading, there are three different fields that can alter your search results depending on what you type. Just type the username of a person with a Twitter account, or several usernames separated by a comma. Then choose whether you want results exclusively sent by that account, to that account, or that mentioned that account. What’s valuable about these fields is that you can type the username of a person’s Twitter account, and include the word “email,” and the search results will include any email address that the person has posted in a tweet. That can be immensely helpful if you’re using Twitter for link building. Under the Places heading, you can type in a location and the search results will include tweets from that area. You can type an area code, ZIP code, postal code, city, state, or country to get results within a 15-mile radius. This is useful if you are geotargeting, or if you own a brick-and-mortar and are trying to refine your local marketing strategy. Under the heading ‘Dates,’ you can select a specific date range and only receive search results from that time. One thing to note is that the first tweet was sent on March 21, 2006, so the system would default to that date if you entered a date earlier than that one. 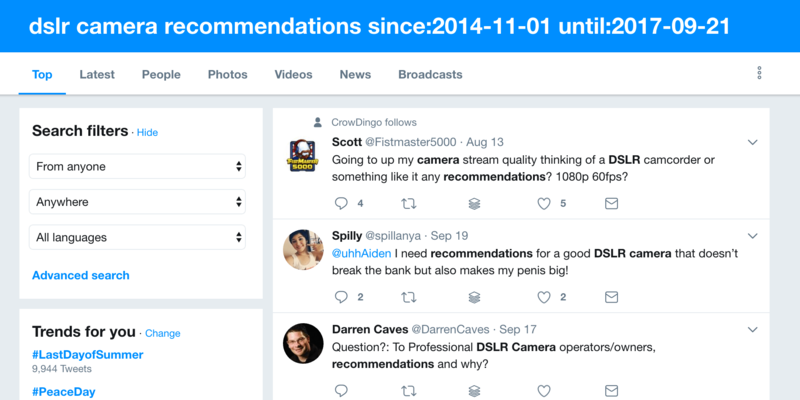 We’ll look more in depth at how you can use these fields in particular for lead generation a little later, but for now, let’s take a quick look at what your search results would look like using Twitter Advanced Search. Top: This is a list of what Twitter considers the tweets that are triggering the most reaction. More options: This includes categories such as ‘news’ and ‘broadcasts’ that include links to news sites and tweets with live streaming video links. 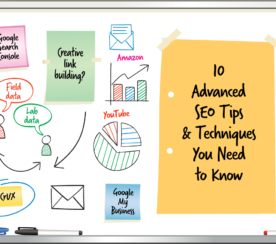 After reviewing the results, you may realize that you need to refine or broaden your search, and you can do that by simply going back to the Advanced Search page. 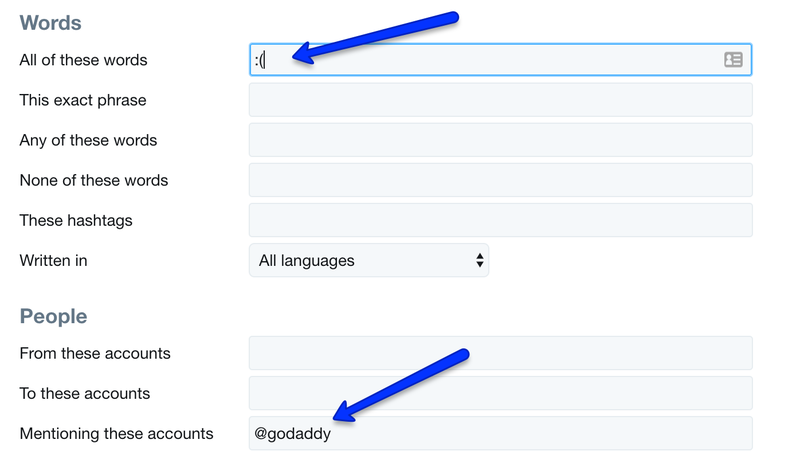 Similar to the advanced search operators available for Google, Twitter also provides for a wide-range of search “tricks” to help narrow in on your target from any of Twitter’s search boxes. These will help you weed out the useful tweets from the pics of what users had for dinner. The Advanced Search feature can provide your business with valuable demographic information, information about prospects in your local area, and lead generation opportunities. Type in the name of a major competitor under the exact phrase field in Words, and under the ‘Mentioning these accounts field under People. Then click the ‘Negative’ box under Other and analyze the results. Make a spreadsheet of all the users who have negative comments about your competitor, and reach out to them with promo codes and discounts, knowing that they are dissatisfied with the product or service they received. In the example below, a brand competitive with GoDaddy searched for negative tweets about the company, hoping to take advantage of customer dissatisfaction. Type in the name of a product or service you offer under Words. If you sell computer security software, you would type that phrase + a “?”. You can use the results to create a database of people who have made inquiries about products or services you sell and reach out to them about what you can offer. These are only two of the ways you can generate leads from Twitter Advanced Search, but they are effective because they identify people who are unhappy with products or services they purchased or people who have expressed interest in those products and services but may have not yet engaged with a seller. Twitter Advanced Search helps you to analyze your market, judge how your competitors are doing based on positive or negative sentiment, and improve your geotargeting based on the number of tweets in specific locations. 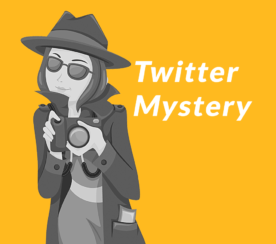 It may take a few searches before you understand all the ways you can manipulate the results, but once you do, you can hone in on the information you need to help boost your Twitter marketing efforts.